Jarvice Bukirwa Sekajja is a community development specialist with extensive qualitative research skills and more than 16 years experience in institutional capacity building and designing and implementing participatory programs on HIV and AIDS, sexual reproductive health, orphans and other vulnerable children, and gender. Jarvice has worked with various donor funded projects and NGOs in Uganda including, USAID DISH; Pathfinder International, Academic Alliance for AIDS Care and Prevention in Africa – Gates Grant; USAID funded Inter-Religious Council of Uganda; USAID HIPS and AfriChild Centre for the study of the African Child (Makerere University). She has served as a principal investigator and led various baseline studies and evaluations on HIV and AIDS, nutrition, VSLA, OVC, and sexual and gender-based violence. 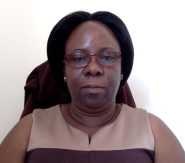 Jarvice holds a doctorate in social work, a master’s degree in social sector planning and management, a post graduate diploma in project planning and management from the Uganda Management Institute, and a bachelor of arts in education Degree from Makerere University.